Rabbi Yisroel (Israel) ben Eliezer (רבי ישראל בן אליעזר ‎ August 27, 1698 – May 22, 1760), better known as the Ba'al Shem Tov, was an eighteenth century Jewish mystic and the founder of Hasidic Judaism. He was born to parents named Eliezer and Sara in Okopy, a small village that over the centuries has been part of Poland, Russia, and Galicia, and is now part of Ukraine. He died in Medzhybizh, also now in Ukraine. The title Baal Shem Tov is usually translated as "Master of the Good Name," although it is more correctly understood as a combination of Baal Shem ("Master of the [Divine] Name") and Tov (an honorific epithet). The name Besht (בעש"ט)—an acronym from the words comprising that name—is typically used for him in print, but not in speech. The appellation "Baal Shem" was not unique to Yisroel ben Eliezer, being used by various mystics, healers, and miracle-workers. However, today it is he who is most clearly identified as the "Baal Shem," as he was the founder of the spiritual movement of Hasidism. From the numerous legends connected with Besht's birth it appears that his parents were poor, upright, and pious. When he was orphaned, his community cared for him. At school, he distinguished himself by his frequent disappearances, being found in the lonely woods surrounding the place, rapturously enjoying the beauties of nature. Not a great intellect, he worked in menial jobs after his second marriage but went on to become a healer, maker of protective amulets, and later a teacher of an uncomplicated mysticism. His emphasis on the simple "Torah of the heart" appealed greatly to the Jewish masses but offended rationalist talmudists and ascetic kabbalists alike. Many of his disciples believed that he came from the Davidic line, and by extension with the institution of the Jewish Messiah. Emphasizing unselfish love for one's fellow man and a joyful union with God accessible to all, his movement spread rapidly in the later eighteenth and nineteenth centuries and remains a potent force, though not a unified one, in today's Judaism. The young Israel ben Eliezer's benefactors gave up the hope of him ever becoming a rabbi and made him a "helper," who took the children to and from school and rehearsed short benedictions and prayers with them. His sentimental nature, to which his later success was in great measure due, now stood him in good stead, as his explanations were well suited to his students' understanding. Later he became shammash (sexton) in the same community, and at about 18 he married. When his young wife died, he left the place, and after serving for a long time as helper in various small communities of Galicia, he settled as a teacher at Tlust near Brody. The Baal Shem Tov's personal Siddur (prayer book), now in the Chabad library archive #1994). Because of his recognized honesty and his knowledge of human nature, he was also chosen to act as arbitrator and mediator for people conducting suits against each other. In this avocation he succeeded in making so deep an impression upon the rich and learned Ephraim of Brody that the latter promised Israel his daughter Chana in marriage. The man died without telling his daughter of her betrothal, but when she heard of her father’s wishes, she did not hesitate to comply. Besht's (Baal Shem Tov's) wooing was characteristic. In the shabby clothes of a peasant he presented himself at Brody before Abraham Gershon of Kitov, brother of the girl, a recognized authority in the Kabbalah and the Talmud. Gershon was about to give him alms, when Besht produced a letter from his pocket, showing that he was the designated bridegroom. Gershon tried in vain to dissuade his sister Chana from shaming their family by marrying him, but she regarded her father's will alone as authoritative. After his marriage, Besht went to a village in the Carpathians between Brody and Kassowa. His earthly possessions consisted only of a horse given him by his brother-in-law. He worked as a laborer, digging clay and lime, which his wife delivered every week by wagonload to the surrounding villages, and from this they derived their entire support. Israel ben Eliezer and Chana had two children: Udl and Zvi Hersh. Udl was born in 1720. Zvi Hersh was born some fifteen years later. 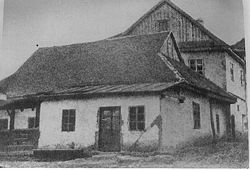 "Exterior of the Baal Shem Tov's Shul (synagogue) in Medzhybizh, circa 1915. The shul no longer exists. Besht's condition was bettered when he took a position as a ritual butcher in Kshilowice, near Iaslowice. He soon gave up this position in order to conduct a village tavern that his brother-in-law bought for him. During the many years that he lived in the woods and came into contact with peasants, Besht learned how to use plants for healing purposes, create amulets, and to effect miraculous cures. After many successful trips in Podolia and Volhynia as a "Baal Shem"—a mystical healer/miracle-worker—Besht decided (about 1740) to expound his teachings in the shtetl of Medzhybizh. Many people, mostly from the spiritual elite, came to listen to him. Medzhybizh became the seat of the Hasidic movement and dynasty. The Baal Shem's following gradually increased, and with it the hostility of conservative talmudists who objected to his anti-rationalist approach. However, Besht was supported at the beginning of his career by two prominent talmudic scholars, the brothers Meïr and Isaac Dov Margalios. Later he won over Rabbi Dov Ber of Mezrich, who lent his authority to introduce the Baal Shem's doctrines into learned circles. Some direct historical evidence remains of the Besht during the days he lived in Medzhybizh, notably his daily prayer book (siddur) with his handwritten personal notes in the margins, which is owned by the Agudas Chabad Library in New York. 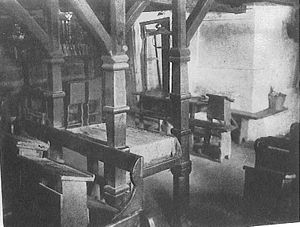 Tax records bearing his name also exist, and a small synagogue Medzhybizh bore his name until its destruction in the twentieth century. His grave can still be seen today in the old Jewish cemetery in Medzhybizh. Antagonism between Besht and the talmudists was apparent at each of his public appearances; but the open breach did not come about until later. He argued equally vehemently against versions of Lurianic kabbalah which emphasized ascetic practices, as opposed to his more simple, joyous mysticism. Besht sided with the talmudists in their disputes with Frankists, the followers of Jacob Frank who took the kabbalistic idea of tikkun (restoration) to such lengths that they openly flaunted the Jewish moral laws and even had themselves baptized as Christians, in imitation of the kabbalistic messiah Shabbetai Zevi's conversion to Islam. It was in keeping with Besht's character that he was deeply disturbed by the Frankists' acceptance of baptism—thereby severing themselves from the Jewish community—for he reportedly said: "As long as a diseased limb is connected with the body, there is hope that it may be saved; but, once amputated, it is gone, and there is no hope." The furor in the Jewish community resulting from the Frankist movement undermined his health, and he died shortly after the conversion of many Frankists to Christianity. The Baal Shem Tov's teachings are characterized by what has been called a panentheistic conception of God. He declared the whole universe, mind and matter, to be a manifestation of the Divine Being. However, this manifestation is not an emanation from God, for nothing can be separated from Him. All things are rather forms in which God reveals Himself. When a person speaks, therefore, he should remember that his speech is an element of life, and that life itself is a manifestation of God. Even evil exists in God. This seeming contradiction is explained on the ground that evil is not bad in itself, but only in its relation to man. It is wrong to look with desire upon a woman, but it is divine to admire her beauty. This admiration becomes sinful only insofar as man does not regard beauty as a manifestation of God, but misconceives it and thinks of it in reference to oneself. Nevertheless, sin is nothing positive, but is identical with the imperfections of human deeds and thought. Whoever does not believe that God resides in all things, but separates God and them in his thoughts, has a mistaken conception of God. It is equally fallacious to think of creation as an act which took place only at a certain time. Creation—that is, God's activity—has no end. God is ever active in the changes of nature. The first result of the Baal Shem Tov's attitude was a remarkable optimism. Since God is immanent in all things, all things must possess something good in which God manifests Himself as the source of good. For this reason, Besht taught, every person must be considered good, and his sins must be explained, not condemned. One of his favorite sayings was that no man has sunk too low to be able to raise himself to God. It was his chief endeavor to convince sinners that God stood as near to them as to the righteous, and that their misdeeds were chiefly the consequences of their folly, not their basic character or nature. Another important result of his doctrines was his denial that asceticism is pleasing to God. "Whoever maintains that this life is worthless is in error," he said. "It is worth a great deal; only one must know how to use it properly." From the very beginning, Besht fought against that contempt for the physical world which, through the influence of Isaac Luria's version of the Kabbalah, had almost become a dogma among many Jews. He considered care of the body as necessary as care of the soul; since matter is also a manifestation of God, and must not be considered as hostile or opposed to Him. Signature of the Baal Shem Tov. In connection with his struggle against asceticism, he also fought against the strictness and the sanctimoniousness that had developed from the strict talmudic standpoint. Besht did not require the abrogation of any religious ceremonies or of even a single observance, however. His target was the overemphasis of many talmudists on the fulfillment of a law, while almost entirely disregarding sentiment or the growth of man's inner spiritual life. While the rabbis of his day considered the study of the Talmud as the most important religious activity, Besht laid all the stress on prayer. "All that I have achieved," he once remarked, "I have achieved not through study, but through prayer." Prayer, however, is not merely petitioning God to grant a request, nor even necessarily speaking to God, but rather "cleaving," (dvekut)—the glorious feeling of "Oneness with God Almighty"—the state of the soul wherein a man or woman gives up his or her consciousness of separate existence, and joins oneself to the eternal being of God. Such a state produces indescribable bliss, which is the foremost fruit of the true worship of God. Besht's methods of teaching differed essentially from those of his opponents and contributed greatly to his success. He made great use of parables and stories, worshipped with unashamed joy in his union with God, and was possessed of an infectious sense of humor. He directed many memorable satirical remarks against his opponents. An especially characteristic one was his designation of the typical talmudist of his day as "a man who through sheer study of the Law has no time to think about God." Much of Besht's success was also due to his firm conviction that God had entrusted him with a special mission to spread his doctrines. In his enthusiasm and ecstasy he believed that he often had heavenly visions revealing his mission to him. In fact, for him, every intuition was a divine revelation; and divine messages were daily occurrences. A well just outside of Medzhibozh thought to be hand-dug by the Baal Shem Tov himself. It still flows fresh water. About his parentage, legend tells that his future father, Eliezer, was seized during an attack (by the Tatars perhaps), carried from his home in Wallachia, and sold as a slave to a prince. On account of his wisdom, he found favor with the prince, who gave him to the king to be his minister. During an expedition undertaken by the king, when other counsel failed, and all were disheartened, Eliezer's advice was accepted; and the result was a successful battle of decisive importance. Eliezer was made a general and afterward prime minister, and the king gave him the daughter of the viceroy in marriage. But, being mindful of his duty as a Jew and as the husband of a Jewess in Wallachia, he married the princess only in name, without consummating the relationship sexually. After being questioned for a long time as to his strange conduct, he confessed his race to the princess, who loaded him with costly presents and aided him to escape to his own country. On the way, the prophet Elijah appeared to Eliezer and said: "On account of thy piety and steadfastness, thou wilt have a son who will lighten the eyes of all Israel; and Israel shall be his name, because in him shall be fulfilled the verse (Isaiah 44:3): 'Thou art my servant, O Israel, in whom I will be glorified.'" Eliezer and his wife Sarah, however, reached old age childless and had given up all hope of ever having a child. But when they were nearly a hundred years old, the promised son (Besht) was born. Besht's parents died soon after his birth; bequeathing to him only the deathbed exhortation of Eliezer, "Always believe that God is with you, and fear nothing." Besht ever remained true to this injunction. Thus, on one occasion, when he was escorting schoolchildren to synagogue, a wolf was seen, to the terror of old and young, so that the children were kept at home. But Besht, faithful to the bequest of his father, knew no fear; and, on the second appearance of the wolf, he assailed it so vigorously as to cause it to turn and flee. Now, says the legend, this wolf was Satan (or, in some versions, a werewolf inspired by Satan). Satan had been very much perturbed when he saw that the prayers of the children reached God, who took more delight in the childish songs from their pure hearts than in the hymns of the Levites in the Temple in Jerusalem; and it was for this reason that Satan tried to put a stop to Besht's training the children in prayers and taking them to synagogue. From this time on, successful struggles with Satan, demons, and all manner of evil spirits were daily occurrences with Besht. At this time, too, according to tradition, the Baal Shem Tov learned how to work miracles with the name of God. The following is an instance: In Constantinople, where Besht stopped on his intended journey to the Land of Israel, he was received with unusual hospitality by a worthy couple who were childless. In return for their kindness Besht, when departing, promised them that they should be blessed with a son, and rendered this possible by the utterance of the Sacred Name. Now, to do this is a great sin; and scarcely had the words of the incantation passed Besht's lips when he heard a voice from the heavens declaring that he had forfeited thereby his share in the World To Come. Instead of feeling unhappy over such a fate, Besht called out joyfully: "Blessed art Thou, O Lord, for Thy mercy! Now indeed can I serve Thee out of pure love, since I may not expect reward in the future world!" This proof of his true love for God won pardon for his sin, though at the expense of severe punishment. To use his own words, "The ideal of man is to be a revelation himself, clearly to recognize himself as a manifestation of God." True mysticism, he said, is not found merely in the study of the Kabbalah, but in that sense of oneness with God. The man who is capable of this feeling is endowed with a genuine intuition, and it is the perception of such a man which is called prophecy, according to the degree of his insight. From this it results, in the first place, that the ideal man may lay claim to authority equal, in a certain sense, to the authority of the prophets. Amalek is still alive today.…Every time you experience a worry or doubt about how God is running the world—that's Amalek launching an attack against your soul. We must wipe Amalek out of our hearts whenever—and wherever—he attacks so that we can serve God with complete joy. Just as important as the Baal Shem's teachings, however, are his character and example of mystical joy. It may be said of Hasidism that there is no other Jewish sect in which the founder is as important as his doctrines. The spirit of the Besht himself is still at the center for the Hasidism. As Schechter (Studies in Judaism, 4) observed: "To the Hasidim, Ba'al-Shem …was the incarnation of a theory, and his whole life the revelation of a system." The Baal Shem Tov directly imparted his teachings to his students, some of whom founded their own respective Hasidic dynasties. These students include Rabbis Jacob Joseph of Polonoye (1710-1784), Ze'ev Wolf Kitzes of Medzhybizh (1680-1775), Yechiel Michl of Zlotchov (1721-1786), Dov Ber of Mezeritch (1704-1772), Pinchas of Korets (1728-1790), Nachum Twerski of Chernobyl (1730-1797), Leib of Shpole (1725-1812), and Avraham Gershon of Kitov, who was Besht's brother-in-law (1701-1761). According to the early Hasidic work Mekor Boruch, the Baal Shem Tov's grandson, Boruch of Medzhybizh (1753-1811), was the Baal Shem Tov's designated successor. However in practice, the succession fell to Dov Ber of Mezeritch and others in the Baal Shem Tov's generation because of Boruch's young age at the time of Besht's death. The Baal Shem Tov left no books recognized as his today, for the kabbalistic commentary on Psalm 107, known as Sefer mi-Rabbi Yisrael Ba'al Shem-tov and ascribed to him, is hardly genuine. In order to get at his teachings, it is therefore necessary to turn to his utterances as given in the works of the old Hasidim. Immediately after the death of its founder, Hasidism was divided into various parties, each claiming for itself the authority of Besht. Thus, the utmost of caution is necessary in judging as to the authenticity of his utterances. Hasidism today is a diverse phenomenon, but one thing all hasids hold in common is a tradition of joyous worship and deep love of God instilled in them by the spirit of the Baal Shem Tov. ↑ Miracles of the Baal Shem Tov meaningfullife.com Retrieved November 14, 2007. All links retrieved December 8, 2016. The Baal Shem Tov Foundation baalshemtov.com. Baal Shem Tov mini-site chabad.org. Map of the Baal Shem Tov and his disciple's travels routledge.com. Thirty Six Aphorisms of the Baal Shem Tov chabad.org. History of "Ba'al Shem Tov"
This page was last modified on 9 December 2016, at 00:02.